The Inventions and Dimensions series on Thursday nights at the Ram Jam Club in Kingston is rapidly becoming one of the cornerstone musician-led gigs on the scene in the London area. Kingston-based guitarist Tony Heiberg, for LJN, interviewed saxophonist DUNCAN EAGLES to find out more. LondonJazz News: How long has Inventions and Dimensions been running? 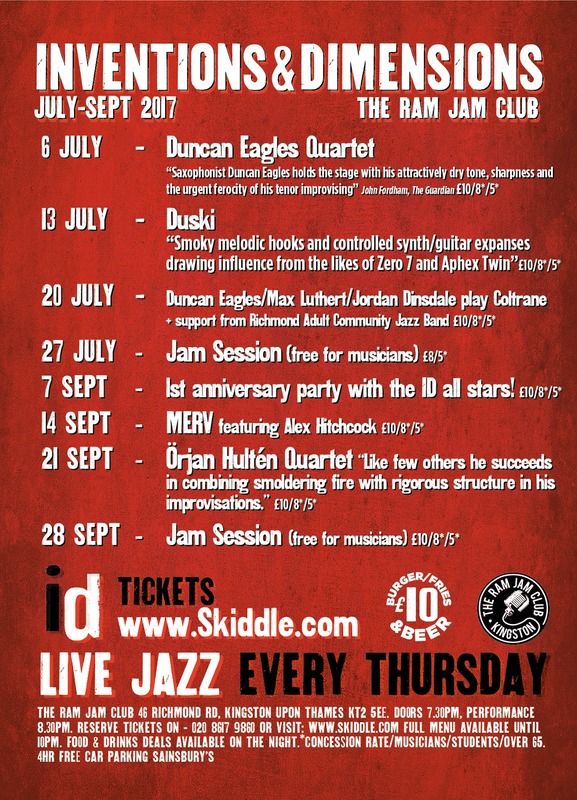 Duncan Eagles: We - Max Luthert, Tony Woods, Nette Robinson, Mike Brunt and I - inherited the Thursday nights at the Ram Jam Club in Kingston from saxophonist Tim Whitehead last summer and started our programming in September. LJN: What is the concept behind the programme? DE: We are providing a platform for new and emerging projects performing original music that does not usually get heard in this part of London. LJN: What are some of the highlights so far? DE: It was great to have American pianist George Colligan over with heavyweight saxophonist Jon Irabagon whilst they were touring with drummer Andrew Bain. To hear musicianship of this standard in such an intimate setting is very inspiring. LJN: And what has been the UK's response to these American interlopers? DE: We've had excellent gigs from the likes of Nick Costley-White, Ralph Wyld and Tom Syson - to name just a few of the great bands we've presented so far. DE: Well, booking me is an absolutely essential part of the criteria for any band being considered for a gig at the club. LJN: I suspected as much. May we have a list, please? DE: Some of the new projects I'm currently involved with that have performed include my brother Samuel Eagles' band - which recently won a special prize at the finals of the Bucharest International Jazz Competition - Max Luthert's Orbital, guitarists Gero Schipmann and Filipe Monteiro's respective bands and, of course, your fabulous band, Tony. LJN: So how do the other musicians that help run the night manage to get a look in? DE: It's actually really great to have Nette, Tony and Max on board as they also bring their various projects to the club. And Mike Brunt is a lifesaver. Mike designs the artfully crafted posters and flyers - in addition to presiding over the door every week with a seemingly endless amount of energy and enthusiasm. LJN: Admirable. But I expect Mike to stop charging me on the door after this piece comes out. LJN: As someone who used to write for a comedian in the cast of Saturday Night Live, I've enjoyed the droll comedy in your promo videos. LJN: What can we look forward to in the future? 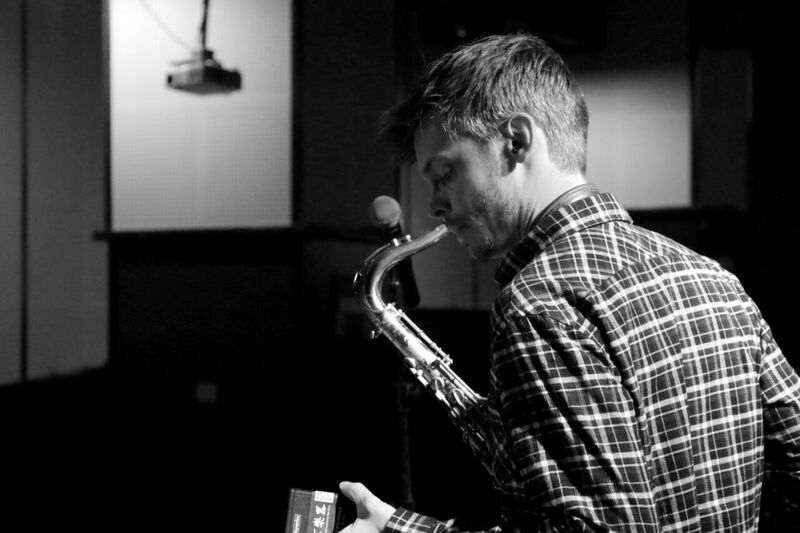 DE: Inventions & Dimensions will be presenting six concerts as part of the London Jazz Festival including performances from bands lead by Alex Bonney, Ant Law and Dom Pipkin. We'll also have a performance from Orjan Hulten's quartet, a great sax player from Sweden, and up and coming pianist Tom Millar. DE: Well, actually, my band, The Duncan Eagles Quartet, will be playing, also as a part of the London Jazz Festival programme, on 16 November - get your tickets now, folks - along with this Thursday, which promises to be mega. 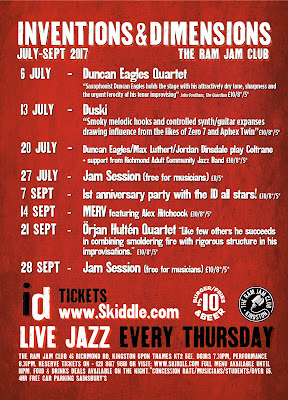 Inventions & Dimensions - live jazz every Thursday. The Ram Jam Club 46 Richmond Road Kingston upon Thames KT2 5EE Tel: 020 86179860, Doors: 7.30pm.